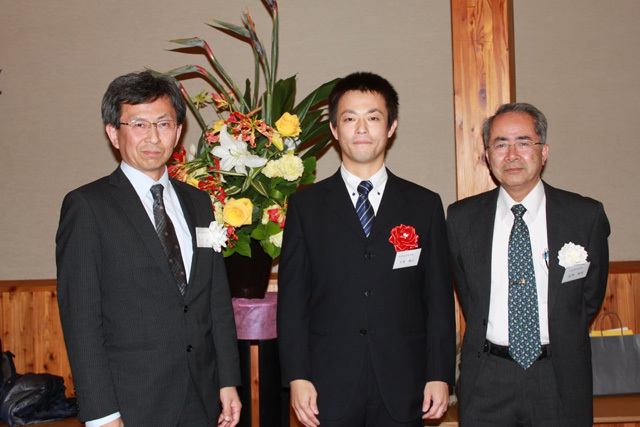 Takeshi Shimosato (Associate Professor) of the Faculty of Agriculture won the 14th Japan Prize in Agricultural Sciences, Achievement Award for Young Scientists at the general meeting of the Foundation of Agricultural Science of Japan, held on November 27, 2015. On this day, an award ceremony and lectures by the winners were held at The University of Tokyo Faculty of Agriculture Yayoi Auditorium, Ichijo Hall. 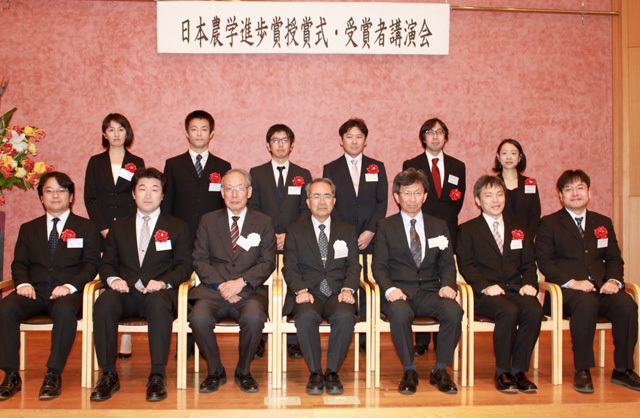 The Japan Prize in Agricultural Sciences, Achievement Award for Young Scientists is presented to young researchers under the age of 40 years who have made contributions to progress in such fields as life science, environmental science, biological production science and food science. Recommendations were fielded from institutions related to agricultural science from throughout Japan, with 10 people winning the award this fiscal year. The title of Shimosato’s winning research is, “Oral delivery and immunomodulatory effects of oligodeoxynucleotides from lactic acid bacteria.” Oligo DNA (short fragments of DNA) is known as a functional molecular material that possesses superlative immune functions, including the prevention of infectious diseases or anti-allergic actions. Shimosato established a method for subsuming oligo DNA with nanosized calcium particles, and succeeded in developing “DNA nano capsules for oral use” that are delivered straight to the intestines without being dissolved by gastric juices. This research will result in the creation of new functional foods and ingredients for livestock feed with oligo DNA as an active ingredient. The benefits of oral administration include the lack of a need for syringes, convenience and low cost, and reduced risks in treatment and low pain. In the case of this award, Shimosato received particular praise for this having established an intestinal tract delivery system for oligo DNA.